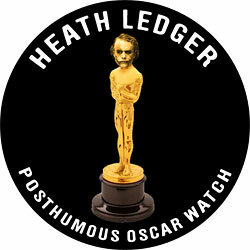 Will Heath Ledger’s Oscar Also Mysteriously Vanish Somewhere Over Guam? This Oscar season has been, depending on your viewpoint, either blessedly or boringly free of drama. Sure, there was a minor fracas when Kate Winslet’s performance in Revolutionary Road got snubbed, and unknown forces (who certainly don’t go by the name Harvey Weinstein) unsuccessfully tried to get a Slumdog Millionaire backlash started. However, as we enter the final hours before Sunday night’s Academy Awards show, one final controversy seems to be brewing — some would say is being stirred — regarding what will happen to Heath Ledger’s Best Supporting Actor Oscar. Will it go to his daughter or, gasp, will it go MISSING like his Golden Globe and Critic’s Choice Award? Actually, we’re pretty certain there isn’t any sort of grand conspiracy at work here and that Ledger’s Oscar will ultimately get into the right hands. But, just in case, it wouldn’t hurt to pay very close attention to eBay over the next couple of weeks. Now, as loyal Vulture readers will remember, Academy rules dictate that Ledger’s Oscar, should he win, will go to his daughter, Matilda. But L.A. Times Oscar kingpin, Tom O’Neil, reports that Ledger’s father, Kim, is planning on taking the Oscar with him back to Australia, where there’s the very real possibility that it could fall through a supernatural rip in the space-time continuum. * And if that weren’t mysterious enough, O’Neil also reports that the whereabouts of Ledger’s Golden Globe and Critic’s Choice Award are currently unknown. Spooky! *Just to be clear, Tom O’Neil didn’t report this part, but that doesn’t mean it won’t happen!